The goal of all beekeepers everywhere should be ripe, fragrant, pure, clean, and flavorful honey. Pure ripened honey is less than 20 percent water. It is thick and forms a rounded, raised drop when it falls on a flat surface. It is easy to field test the water content of your honey. All you need for the test is a box of matches. Dip your match head in the honey to be tested and strike it on the box. If the match lights you have ripened honey; if it fizzles and goes out you have unripe honey or nectar. This test works well unless you need to know the exact water content; then you must use a refractometer. All honey should be processed and cleaned in a room that is bee proof. Bees will come very shortly during the daylight hours to reclaim their prize. Therefore, great care should be taken to have an environment that is closed off to insects so that you may work in peace. If you have screened in windows you may still have thousands of bees buzzing around outside until your honey is in buckets with the lids on. All honey should be processed in a clean environment. There should be no dust or dirt present that could get in and pollute the honey. Always wash your hands and arms and wear latex gloves if squeezing honey from Top Bar combs. Uncapping a Langstroth frame of capped honey. This prepares the honey for extraction from the comb. Squeezing honey from harvested Top Bar comb. Notice the beekeeper is wearing latex exam gloves to ensure the cleanliness of his honey. You will have a big market if you have clean honey! Filter your top bar honey combs through large strainer after squeezing the honey from them. Over-night the wax particles left in the honey will filter to the top and you can skim it off in the morning. A gate valve mounted onto your collection bucket also works well at dispensing your clean processed honey. A “food grade” gate valve should be used on settling tanks as the last step in processing your honey. All detritus in honey is lighter than the honey itself. That means that if given 24-48 hours any honey that sits in the tank will filter itself by sending all impurities to the top of the tank. The gate valves should be cut low into the settling tank. 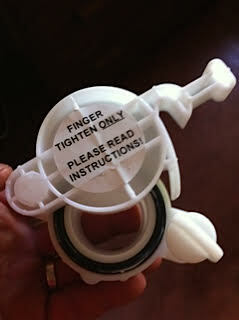 When opened this valve will let pure clean honey flow from the gate. This honey may be bottled directly for marketing. 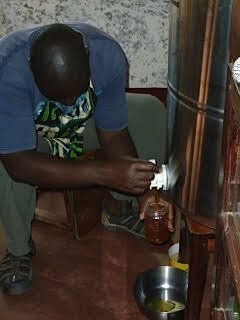 Ledi, uses a settling tank in the last stage of bottling honey. This tank, which can be built out of any large container that has a “food grade” gate valve on it and allows honey to settle. All detritus in honey will settle to the top allowing for clean honey to pour from the tap in the bottom of the tank. 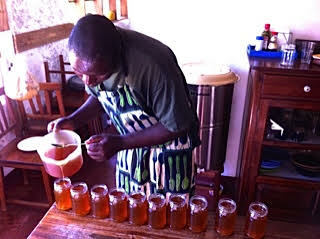 Honey takes a day or two to clarify before it is ready for bottling from the tank. Note: If you want to assist your beekeeping co-op/group bring some of these gate valves to enable them. They can be hard to get in rural areas. We prefer the use of a pitcher in the final step of bottling our honey. It provides good control and makes the job easier than bottling directly from the settling tank. When processing your honey always be sure it is put in uniform, attractive containers for sale. The price paid for the containers will be made up for by the quantity of honey sold. All honey should be kept away from strong smelling substances. Even after stored in buckets, honey should not be kept near substances such as petroleum or tobacco. 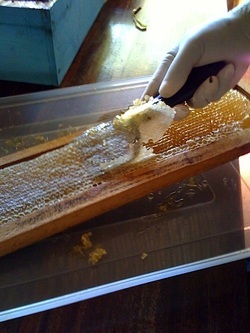 In processing mixed comb, all brood comb must be cut away from the honey comb before squeezing your comb. Any brood juices will destroy the quality of your honey, shortening shelf life. All honey should be kept in a closed, cool (not cold) room. Honey that is exposed to sunlight is at risk of going flat (losing its flavor and consistency). Keep it in a dark storage area. Honey is graded by color. The blonde honey pictured above is close to water white in color. This color is the most sought after. The honey pictured below is the other side of the spectrum, a color called dark amber. This honey is dark because it contains more minerals. Light honey often has a milder taste than dark honey, but all honey is excellent for consumption. Lighter honey will sell faster than dark honey. 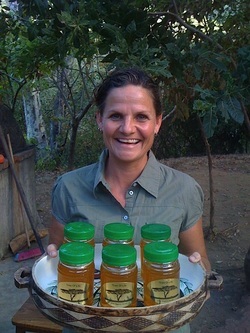 Process your honey and sell it in uniform clear containers. Honey that is packaged well will sell well! Honey will not sell well from coke bottles with a corncob in the top. If you have the ability to help local beekeepers market their honey, do so by allowing them to purchase clear plastic jars from you. Often there are no local sources for such jars. A source that we know and recommend is Safepak located in the industrial area of Nairobi. They have a website listing all different shapes and sizes of jars.